Project Type: WordPress website design and implementation. 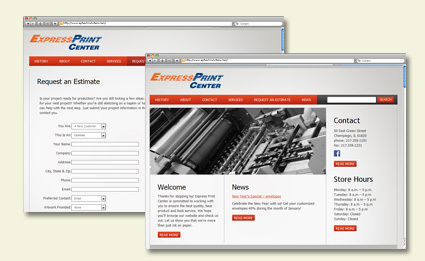 Project Description: Information focused, this website’s task is to serve as the online sales staff for the Express Print Center’s online marketing efforts. With sections of the site focused toward detailing the serves offered by Express Print, there is also a blog that imparts helpful tips designed to help the client get the most out of their print efforts. The design needed to be contemporary and quickly indicate to the view that Express Print is a one stop print service for all of the clients printing needs. While the behind the scenes workings of the website had to allow for the client to change any information located on the site on their own without Six Demon Studio interaction. The result was a home run for the client that went beyond all of their current needs as well as laying the foundation for further expansion such as the ability to upload files via a web interface once Express Print reaches that point in their growth.